Diesel Maintenance - Romeo's Marine & Autobody Ltd.
Our survey customers often ask us about how they should perform diesel maintenance. This is a very easy question to answer. We’ve yet to see a diesel manufacturer that did not produce an excellent manual. They also provide a book-size parts manual. If you read and follow the one, you should have little use for the other. Diesel manuals contain every bit of information you need to know about how to maintain your engines, and more. What follows is a general discussion of what you should do and why you should do it. One of the reasons why people often do not follow these instructions is because the frequency of recommended maintenance is a little bit more than the boat owner bargained for in terms of time and cost. In fact, our experience is that 80% of all the engines we see, in terms of the maintenance condition, come nowhere close to what the manuals recommend. This is what happens to pistons after an overheat. The piston is distorted and the rings are stuck, frozen into the ring grooves. This then caused blow-by into the crankcase. High exhaust emissions into the crankcase then caused an acid build up in the lube oil that resulted in this bearing erosion. Eventually this will result in bearing failure. The root cause, however, was lack of cooling system maintenance. Few people are unaware that diesel lube oil must be changed frequently, 100 hours is the usual interval. Why so often? It’s because large amounts of carbon is a by-product that ends up in the oil. If allowed to build up and remain in the oil, the lubricating ability of the oil is severely retarded. Moreover, carbon blocks heat transfer and retards the cooling function of the oil as well. Engine oil will also suffer a build up of sulfuric acid, which can damage bearings as shown above. Equally important is good filters. Believe me, only the very best and most expensive oil filters are good enough to be significantly effective. I recommend that you buy either OEM or top name brand filters regardless of cost. Don’t cheat on your lube oils, either. The manufacturers are not blowing smoke, so just follow the recommendation for oil grades. They know better than your buddy down the dock who may have other ideas that he heard from yet someone else. We don’t know the exact percentage of engine failures that result from lack of cooling system maintenance, but it is surely at least 50%. You need to understand this: Diesel engines operate under a piston compression of around 350 to 550 psi. That is three to four times the amount of a gas engine. This high compression puts great strain on the engine and can build up heat very rapidly (like within 60 seconds) if there is a failure in the cooling system. Diesel cooling systems are vastly more critical than gas engine cooling systems. Gas engines can suffer from numerous moderate overheats without causing catastrophic damage. THIS IS NOT TRUE OF DIESELS. Diesel engines can and will suffer serious damage even as the result of relatively minor overheat conditions. This is because the overheating occurs so rapidly, and because the internal parts are less tolerant of damage than a gas engine. Most overheats occur because the engines are never inspected and leaks are never found and repaired. Cooling system hoses are allowed to age, and they eventually burst, leak or blow off. Another common cause is failure to keep the cooling system clean. Instead of adding a properly mixed solution of recommended coolant, owners just pour water in, or add straight coolant. Proper ratios of engine coolant are critical to proper cooling and the prevention of corrosion. Due to vibration and age, system gaskets do not last forever and will inevitably start to leak. The leaks usually occur in a location that is not easily seen. Thus coolant is lost and the engine overheats. Consider this: Can you take a guess at how often anyone ever checks the engine coolant before starting the engines when we do a sea trial? The incredible answer is that not only do boat owners not check the coolant, they don’t check the oil either. These very confidant souls who are going to eventually pay the price for their carelessness. If your engines or any part thereof vibrate to the point where it looks blurry, or you can see it shaking, rest absolutely assured that that vibration is capable of destroying your engine. First of all, it’s going to break all of the gasket surfaces loose. Or hoses will go loose. And then the engine is going to start leaking fluids. If the engines are vibrating excessively, you need to have the problem diagnosed and get the vibration stopped. You should regard your alarm systems like light bulbs in your house. They will operate for a short period of time and then crap out. They are a constant maintenance thing, and the failure to maintain them could be one of the costliest mistakes you’ll ever make. One of the weaknesses of water temperature alarms is that they will not function when there is a complete loss of cooling water around the sensor. The sensor only works when it is immersed in water. For this reason, I strongly recommend that you have exhaust temperature alarms installed. These will function when the others won’t. The cost of having them installed is minimal, and a drop in the bucket compared to the cost of an overheat. Engine coolant should be checked every time before starting the engine. That does not mean looking at the coolant recovery tank. You should NEVER use the recovery tank as an indication of coolant level in the engine. Half the time these things do not work properly. The first sign of leaking gaskets does not mean that you should replace THAT gasket. it means you should replace all such gaskets. If one is starting to leak, soon they all will. All diesel will have at least three coolers: the heat exchanger, oil and fuel cooler — and most likely a transmission cooler. That makes four for a single engine boat, eight for twin. The problem here is that they all need to be inspected and serviced at least annually. Yes, you are correct. Servicing eight coolers is expensive. But, then, so is overhauling or replacing an engine or two. This is one reason we posit the question of whether you can really afford diesels or not. Many boat owners simply cannot afford this, and so run their engines till they quit. Or put up the for sale sign when it starts blowing smoke. Why is this necessary? Several reasons. You replace the zincs on your boat at least once a year, but perhaps you weren’t aware that your engine is full of the same saltwater that your boat is floating in. If you have corrosion problems on the hull of your boat, then you have corrosion problems inside your engine. Not inspecting the cooling system annually (by means of dismantling it) is like trusting the weather forecast. Another reason is that sea strainer do not take out all foreign material, and deposits of debris can build up inside. Or, if you are operating in very sandy, silty water, abrasion and erosion of the core and other components may be taking place. Faults within the fuel system generally do not cause engine damage, but it does cause damage to itself, as well as serious performance problems. Nowadays it is rare that diesel boats don’t have good Racor or Dahl filters. But it is not rare that many boats have dirty fuel system problems, whether the contaminated fuel results from internal conditions, or taking contaminated fuel on board. Some of the better fuel docks today have open filters where you can actually see whether any contamination is being removed from the fuel. To say the least, this is comforting. Unfortunately, water can accumulate in your tank. The most common way this happens — and it’s remarkable that most people never think of it — is that the fuel filler cap is leaking. The second most common source is through an improperly installed vent line. The third is condensation in the tank. In southeast Florida tank condensation is fairly rare because temperature changes are not conducive. From the central west coast on north it is. People often ask us whether they should maintain their tanks full at all times. The answer to this is not that straightforward. It depends on how much fuel you use. It is not wise to allow old and aging fuel to accumulate in your tank. If you top off after short, infrequent operation every time, the fuel in your tank is going to get old. This can foul up your injectors. But so will water. Water causes bacterial blooms in the fuel, and it only takes a very small amount of water to do this. To my way of thinking, you’d be better off with this happening to a nearly empty tank than a nearly full one. For the most part, it’s going to depend on how much of a bacteria problem you have, and whether frequent changing of your filters can handle it. Long winter layups present an obvious problem. If you have one of those fuel filtering services in your area, that is the way to go since the cost of filters and aggravation can more than make the cost of this service worthwhile. Plus it absolutely does the job. Many boat builders are installing vent filters on tank vent lines. These need to be serviced, so don’t forget about them or one day an engine may magically crap out for no apparent reason. The temperature and cleanliness of the air your engine breathes is very important. That’s why most engine manufacturers are now supplying some kind of air filtration system with their engines, after we’ve complained about engines breathing salty air for years. There’s no end to the ways engines can end up breathing not only dirty air, but air that is full of all sorts of crap like sand. And yes, inside your boat. A typical example is on a trawler type boat with wooden soles. The gap in the hatches is directly over the air intake, and dirt from the sole falls right down the gaps and into the engine. One of the most common problems is engines sucking in crap from deteriorating carpeting backings. Yep, engines eating carpeting, fibers and all. If you don’t have air filters on your engines, get them installed NOW! Turbo charged engines usually require that the air from the hot turbo be cooled. This is done with an inter or after cooler, take your choice of names. Not only do these gizmos cool intake air, but they filter it too. Not by design, but by the same means your air conditioner inadvertently filters air. This clogs the cooler up with a corresponding rise in engine temperature. If your cooling system is already weak, this can be fatal. Yep, you guessed it. Here’s yet another cooler to add to the cost of the maintenance bill. You small boaters, are you really sure you want diesel? Get out the checkbook. Yet another problem is air starvation. Fairly common, this is the result of improper boat design from inadequate ventilation. It, too, causes engine overheating. You can tell when this condition is present when, under way, you go to lift an engine hatch or door and there is a vacuum fighting against it. Another telltale is when you get a dark halo around the perimeter of carpeting and carpeted hatches. This is an absolutely sure sign that the engine room vents are not adequate. The demise of most diesel engines is caused by the cumulative effects of improper maintenance and resulting overheats. Then, suddenly one day the engine goes bang for no apparent reason. There’s a reason all right, but it’s the cumulative effect of poor maintenance. For the most part, diesels are very unforgiving of neglect. Oh, I know you’re probably thinking about those boating books you’ve read that talk about how rugged and dependable diesels are. I’ve seen them too. But if you look closely, you’ll see that they are not talking about HI PERFORMANCE DIESELS. They’re talking about those old 4 and 6 banger naturally aspirated engines that develop 110 hp. Ninety-nine percent of diesel engines in power boats today can be classified as high performance. Meaning that they are not slow, rugged and dependable — rather they are fragile engines that require a great deal of care. It doesn’t take much to push them over the edge. Maintain the engine alarm system. If the alarm system or gauges do not function, this could be one of the costliest mistakes you’ll ever make. Conduct a basic engine survey annually. This is essentially an inspection to search for small problems before they become big ones. The cost to do this is not high, and is likely to save you big bucks in the long run. Inspect sea water pump impellers biannually. Take engine temperatures with infrared gun annually. Open up and inspect the sea water pump and check condition annually. Conduct cooling system inspection and cleaning every two years. Conduct a basic engine survey at beginning of season. This includes all gaskets, hoses, belts and wiring. Inspect sea water pump impellers annually. Change engine oil prior to lay up. Change engine coolant every two years. These recommendations are not intended to supercede engine manufacturer recommendations. Don’t start engines without checking fluid levels. Do not permit engines to sit without running them for more than 7 days. Try to operate engines at least every 5 days. Allow engines to warm up, then run at about 1500 RPM for about 5 minutes, then shut down. Properly lay up engines that aren’t going to be used for periods of greater than 30 days. 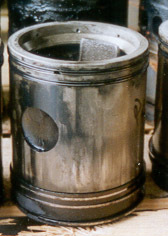 Long periods of disuse results in serious internal engine rusting of cylinder walls and valves. Do not start engines with throttles advanced. Do not race engines until they are up to normal operating temperature. This is very damaging. Avoid prolonged idling if possible. When trolling or idling for long periods, always run the engine at cruise speed or higher on the way home for at least 30 minutes to dislodge carbon deposits. Service fuel system immediately if excessive exhaust emissions occur. Do not operate boat at high speed with badly fouled bottom or when vibration occurs. In addition to readers in the United States, boaters and boat industry professionals worldwide from over 70 countries have purchased David Pascoe’s books, since introduction of his first book in 2001.